Proceeds from Leaders Open Doors to go to worthy organizations that open doors for children with special needs. The royalty donation is the best way for the book to live its own message. Area resident and nationally recognized leadership expert Bill Treasurer is giving back in more ways than one through his latest book "Leaders Open Doors" released in May 2013. In his latest book, Treasurer, founder and Chief Encouragement Officer at Giant Leap Consulting, provides practical and powerful insight from his nearly three decades of experience for leaders to open doors of opportunities for others. Simultaneously, Treasurer, an advocate and parent of a daughter with special needs, is seizing the opportunity to give back, by donating all royalty proceeds from Leaders Open Doors to worthy organizations that open doors for children with special needs. Of the commitment to donating royalties, Treasurer shares in a video that many families include at least one family member with a unique disability, equaling 54 million Americans and the largest minority group in the country. Leaders Open Doors has received a multitude of rave reviews from leaders at all levels, including Fortune 500 CEO’s and international best selling authors. 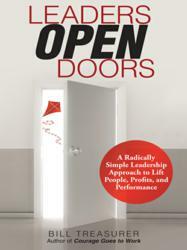 “Leaders Open Doors” is now available for purchase on Amazon at http://bit.ly/Leaders-Open-Doors. Treasurer holds a Master of Science degree from the University of Wisconsin and attended West Virginia University on a full scholarship. He serves as board chairman for Leadership Asheville, is on the board of his local YMCA, and fights for the rights of people with disabilities. Most importantly, he is the father of three beautiful children, Alex, Bina, and Ian. For more information on the Asheville resident and his work, visit: http://www.leadersopendoors.com or http://www.giantleapconsulting.com.